Looking for some solid Gmail Tricks To Try? Gmail has been the most popular email service out there. But there are millions of us that don’t know many of its features. Most of Gmail’s best features and productivity tips are placed under the cover and it would be awesome to get to know them. Here are some Gmail tips and tricks that will help you save hours of emailing and also improve your email productivity skills. Controversial Blog Posts – Advantages, Disadvantages and Guidelines. We apologize for the state of the page. We’re not very proud of the quality of content on this page but are in the process to completely replacing it with the quality that matches our current standards. Please check back later for an updated version. You might have read a lot of controversial stories covered up on various blog posts. With time and continuous protest a few of them are taken down while some of them never lose their popularity and the debate goes on for years. 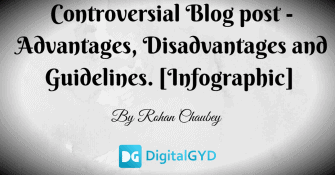 Continue Reading ››Controversial Blog Posts – Advantages, Disadvantages and Guidelines.